to pick up one of Niagara’s most profound Chardonnays. The Hidden Bench Tete de Cuvee 2008 Chardonnay is a stylish stunner that can be enjoyed now or stuffed away in the cellar for five or 10 years. In my opinion, it’s one of the finest Chardonnays made in Niagara. And it’s all sold out at the winery. 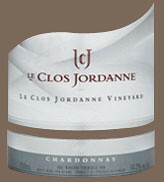 You can also buy the Le Clos Jordanne Chardonnay 2009, another wonderful example of this cool-climate wine made by a top producer. Le Clos’s Chardonnay is from its top vineyard, Le Clos Jordanne Vineyard and one bottling from the top wine made at the estate, Le Grand Clos. These wines aren’t cheap, clocking in at $45 and $40 respectively, but well worth the experience of trying the best of the best. If value is your thing, don’t despair. There is a nice, affordable unoaked Chardonnay being released from Pondview for $17. Here are reviews for the three Chards hitting shelves on Saturday. Hidden Bench Chardonnay Tete de Cuvee 2008 ($45, 94 points) — That is the highest mark I have ever given a Chardonnay in Niagara. And I might be underestimating it.. The top Chardonnay at the estate takes the best barrels of fruit from Locust Lane and Rosomel and blends them into this magnificent cuvee. The 2008 vintage, in my opinion, is one of the finest for Chardonnay Niagara has seen in a while. It was rainy during the summer, but heat and sun at the end of the season and an excellent veraison period contributed to ripe, elegant and balanced Chardonnays. The wine spends 15 months in French oak with weekly lees stirring for the first 10 months. It is bottled unfined and unfiltered and is fermented with indigenous yeast. The nose is spectacular with gorgeous minerality, bright lemon and white peach fruits and hinting at oak, nut and spice accents. It is a pure expression of the stony minerality derived from the Beamsville Bench’s clay-silt-limestone soil. It is such a gloriously layered and textured Chard, with citrus-lemon, laser-sharp acidity, stone fruit, and spicy notes that are integrated rather than over-powering. This beauty is the epitome of elegant Beamsville Bench Chardonnay, with a long, lingering finish. It is built to cellar up to 10 years. This is your last chance to purchase this wine as it’s been sold out at the winery for a while now. Le Clos Jordanne Le Clos Jordanne Vineyard Chardonnay 2009 ($40, 90 points) —This single-vineyard Le Clos Chard has gorgeous, expressive notes of lemon-lime, pineapple, peach, lanoline, buttery-creamy nuances, yet wonderfully integrated, elegant oak tones. It’s layered and textured, with creamy-buttery notes and stone and citrus fruits on the palate. It’s all nicely balanced with juicy acidity and length through the finish. The most approachable Chardonnay from the Le Clos portfolio of Chards at the moment. 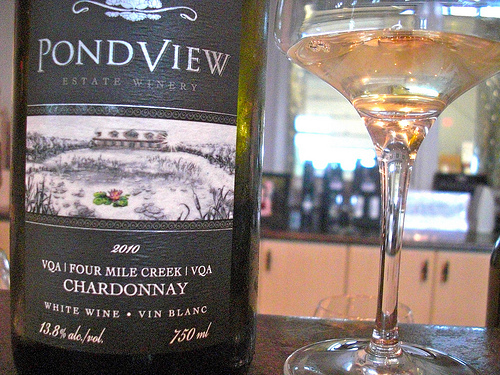 Pondview Unoaked Chardonnay Sur Lie 2010 ($17, 87 points) — A nose of green apple and lemon-lime. It’s quite dry on the palate with mouth-coating apple fruit, a touch of nuttiness to go with bright acidity. The Vintages release at the LCBO on Saturday offers up a chance — your last chance — to pick up one of Niagara’s most profound Chardonnays.